Everything for the care and repair of inflatable boats, dinghies and tenders. Stop the dinghy wobbles, hop in and out of your dinghy tender with ease, with snap davits. 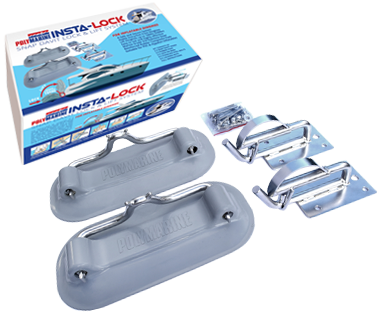 Our ingenious lock-on davit fittings secure an inflatable boat or tender to the swim platform or transom of the main vessel. Polymarine cleaning and maintenance products have been created to deal with specific problems which occur in the marine environment. The range performs with great effect, outshining all other marine products. Polymarine paint adheres with a super strong, flexible bond, becoming part of the surface, to withstand weathering, abrasions. Retainins colours and bright whites for many years. A high stretch ratio that will not crack or flake off. Various size repair kits for all makes of inflatable dinghy and RIBs. The quality products includes specialist adhesives, PVC solvent primer, to repair Zodiac, Bombard, Honda, Valiant and all PVC inflatables. For over 30 years we’ve been serving the Marine trade & boating enthusiasts with inflatable boat supplies, parts and accessories for Avon, Bombard, Honwave, Quicksilver, Sunsport, Valiant, Waveline, Wetline, Zodiac, RIB’s, inflatable boats and small dinghies. 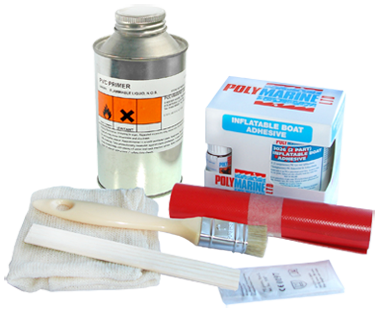 We stock adhesives and professional repair kits, Hypalon and PVC boat fabrics, flexible paints, inflatable boat valves and valve parts to repair all makes of inflatable boats. 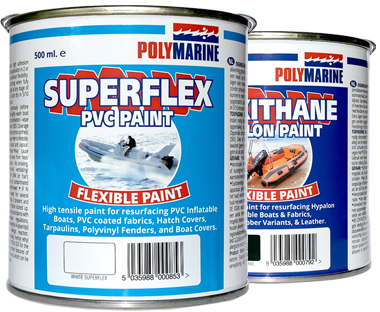 Polymarine hypalon and pvc flexible paints are famous for practical durability with Flexithane, Superflex and SP54 Inflatable Boat Anitfoul being the best on the market. Our PVC adhesive and Hypalon adhesive products are used by industry professionals and life boat repair specialists. Here we feature items for repairing and upgrading your inflatable boat. We provide in depth guides to help with installation and D.I.Y. boat projects from simple repairs to more complex restoration of inflatable boats. These featured boat accessories may help you to identify various methods to improve the condition and safety of your dinghy or RIB.